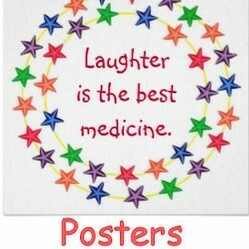 Whether you are looking for a fun reminder, that Laughter is the best medicine, or a funny poster to laugh at or with, you'll find some unique posters to do just that. Check out what various artists have created, to push your laugh button, here. 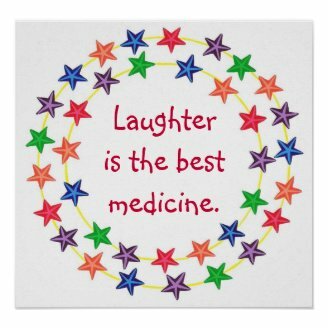 Laughter is good for the mind and the body. 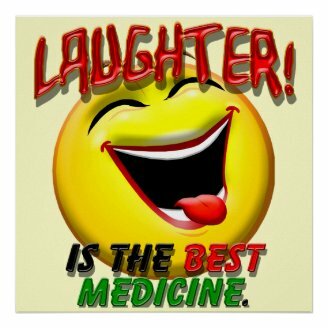 Laughing not only uses stomach and facial muscles, it increases endorphins, which helps with our overall well being. That is definitely something to smile about. Get viewers attention with a colorful eyecatching poster. Colors attract attention. Bright and cheerful ones are more pleasant to read. The smiley face below is laughing so hard, that his tongue is hanging out. Do you remember having a big hardy laugh? Have you ever watched the Big Bang Theory? There was an episode, I think in the 6th or 7th season, where Howard had been applying estrogen cream on his mother's back. He supposedly got too much in to his own system and started acting very feminine like. I thought that show was super funny, and I laughed most of the way through. Watch the babies and see what happens. Then there are posters that just make us laugh. Sometimes it helps to laugh at our mistakes. Do you think the dinosaurs were around when Noah's ark sailed off? What might they have been thinking? Here is a prehistoric oops to tickle your funny bone. Medicine has come a long way. In the days of old, such as when Ben Franklin was living, anesthesiology consisted of strong drink or a bonk to the head to knock the patient out. 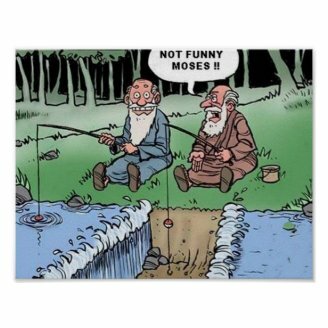 Speaking of prehistoric times, do you think Biblical people played jokes on one another? What would one look like? Did Moses take his powers too far? Before you go, here's a cute joke. What do you get when you put jam on toast? Make me laugh. Do you have a funny clean joke to share? Thank you MikeRobbers. : ) Much joy and laughter to you. @cmoneyspinner Glad you had a chuckle. Stress can build to a dangerous point. It is important to get stress under control before it gets to a dangerous level.